Find a buddy. Get support from friends, whether you just need someone to listen or you’re looking for ideas and encouragement. Having help will make sticking with your goals easier and more successful. Share your goals. Whether you post them on social media or share them with friends, you’ll be more accountable! Track your food today. Don’t worry about recording every ounce and calorie, just put down what you’re eating. No matter how it adds up, you’ll learn from it. Perhaps the great diet you thought you were following wasn’t so exact. Knowing you have to write it down, you may just stop at one serving! Each day we offer a way to get your diet back on track! Try a new recipe. Cooking nutritious foods can be fun! You’ll be surprised how delicious healthy can be! Check out our Recipe of the Week posts for great healthy meal ideas!! The 12 Days After Christmas! 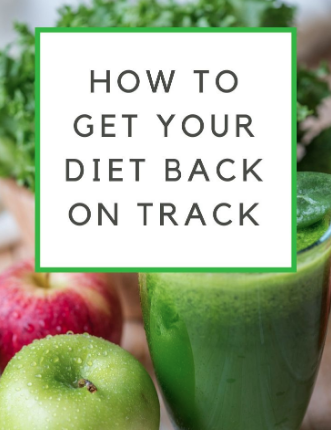 Each day we present a way to get your diet back on track! If you’re tempted by those leftover cookies, try a short workout or a tall glass of water, seltzer, or tea. Even five minutes will help refocus on other things. Staying hydrated may help you curb cravings caused by thirst.